Despite the issue of media freedom has occupied the European public debate following the dramatic attack to the French weekly Charlie Hebdo, normally the public pays limited attention to this topic. Fostering debate and raising awareness on violations of press freedom in 11 countries have been the aims of the 12 European partners engaged until last January in the project "Safety Net for European Journalists", led by OBC and co-funded by the European Union and the Autonomous Province of Trento. The seminar that concluded the project, entitled "Je suis Charlie. 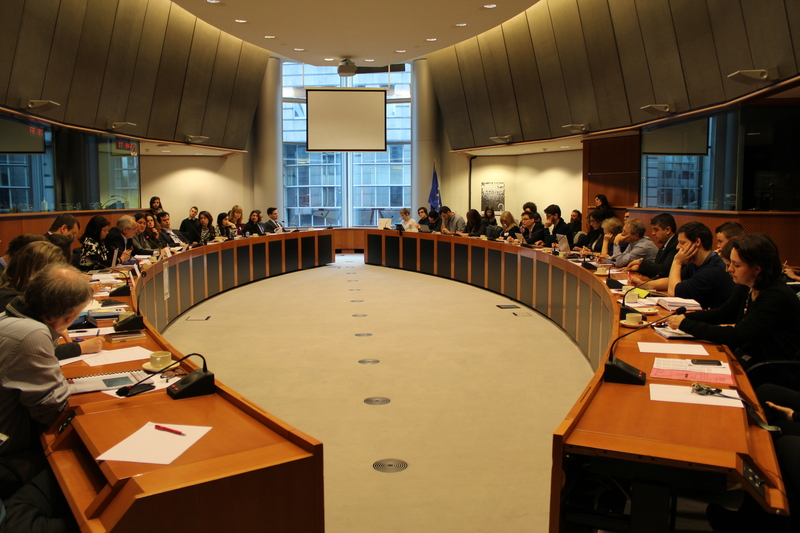 Media Freedom in the EU and South-Eastern Europe", held in Brussels on 28 January, was organised by the Italian think tank Osservatorio Balcani e Caucaso, along with the group of the Greens at the European Parliament, represented by Ms. Ulrike Lunacek, Vicepresident of the EP. In front of an audience composed of MEPs, media experts, journalists from member states and candidate countries, Vice President Ulrike Lunacek opened the works: "The strong interests, political and economic, do not want independent media and push for censorship or self-censorship. That's why we must continue to promote and uphold the freedom of expression, the independence of the media and investigative journalism, as essential elements of democracy". The vice president also highlighted some directions where work is needed: "Strengthening the media legislation in line with EU standards and develop professional values and ethics among journalists". The role of the media as an essential pillar of a democratic society, was also at the core of the speech by Slovenian MEP, Ms. Tanja Fajon: "The Paris attack was a shock but we must take time to reflect, without hasty measures, and the fight against terror must not lead to the restriction of the freedom of expression. The way is to work side by side in Europe on strengthening solidarity, education, integration, expressing the richness of our diversity and our culture". Also Ms. Kati Piri, rapporteur for Turkey at the European Parliament, attended the debate and brought the attention to the Turkish case, where the number of imprisoned journalists is on the rise, and more and more critical voices are silenced. Among the speakers also the MEP Mr. Ivo Vajgl, who stressed that the negative effects caused by external pressures on the media with the consequent loss of credibility of journalists in the public eye (All audio-files of can be found here). Eleven countries monitored, 400 news and analyses published in 9 languages, over 100 journalists met, 550 violations of press freedom documented on the online platform Ushaidi.com, a handbook for threatened journalists, 3 analytical reports: Luisa Chiodi, scientific director of OBC, moved from the achievements of 'Safety Net' to clarify how urgent it is to work every day on this issue. "All the 11 monitored countries show common limitations to media freedom. Among the needs expressed by threatened media professionals, there is a lack of legal assistance, but an important aspect is also the need to receive solidarity from colleagues and the public. After Paris, the topic seems to have regained public attention - said Luisa Chiodi - but ensuring the freedom of the press requires a continued alliance between institutions, media professionals and the society, both at local and international level". Many of these reflections are contained in the study "Building a Safety Net for European Journalists" by Eugenia Siapera, professor of Dublin City University, involved in the project to carry out a comparative research on the needs of journalists, as well as the obstacles they face and the risks related to the exercise of the profession. Finally, numerous project partners have actively contributed to the discussion emphasising, among other things, the role that the EU can play in defence of press freedom in the most fragile institutional contexts, such as Turkey and South East Europe, as well as in the Member States.